A great hospital is one of the cornerstones of a successful city. In our city, The Ottawa Hospital is the central heartbeat that contributes to the quality of life of the whole of the community – making Ottawa a stronger, healthy, and prosperous city. cancer care for the region. We provide the best care to the sickest patients and to those with the most complex health-care issues, with the compassion that aims to treat you like a loved one and make you feel at home. The Ottawa Hospital is one of the top five research hospitals in Canada. Our researchers are investigating every major disease and re-shaping health care, replacing existing ways of being treated with new, better methods. The ability to quickly translate new discoveries into therapies that can be tested in clinical trials is one of our unique strengths. With this ability and our international reputation for innovative stem cell research, it is no exaggeration to say that the world looks to The Ottawa Hospital for new breakthroughs and cures. The Ottawa Hospital is changing how medicine is practiced in Ottawa, Canada, and around the world. As a leader in cutting-edge research and technology, it is at your Hospital that ideas come to life, collaboration leads to success, and new tools advance patient care. Throughout the coming decade, we will embark on a quest that will change Ottawa’s health care landscape for the next century. Our goal is, and will remain, providing exceptional care to every patient that walks through our doors. To do so, we must continue to fund research, equipment and care - not all of which is covered by the province. This is when we turn to our community leaders. Community support enables us to buy new, cutting edge equipment to treat people in our community. It enables our researchers to lead world-first clinical trials, and develop better therapies and cures for the most debilitating diseases. In some cases, a donation can be leveraged up to 10 times by external funding – making every dollar you and your employees invest go even further. Research in regenerative medicine, cancer, and to improve patient care. Cancer care equipment and facilities. Technology and equipment to enhance treatment options. We are proud to be recognized as one of the most efficient and effective hospital foundations in all of Canada. We are recognized by the Association for Healthcare Philanthropy as a Top Performer in North America. In 2014, The Ottawa Hospital launched the Tender Loving Research campaign to raise $50m over three years. Funds raised will be allocated to research on regenerative medicine, cancer, and improving patient care. We have raised $38m to date. 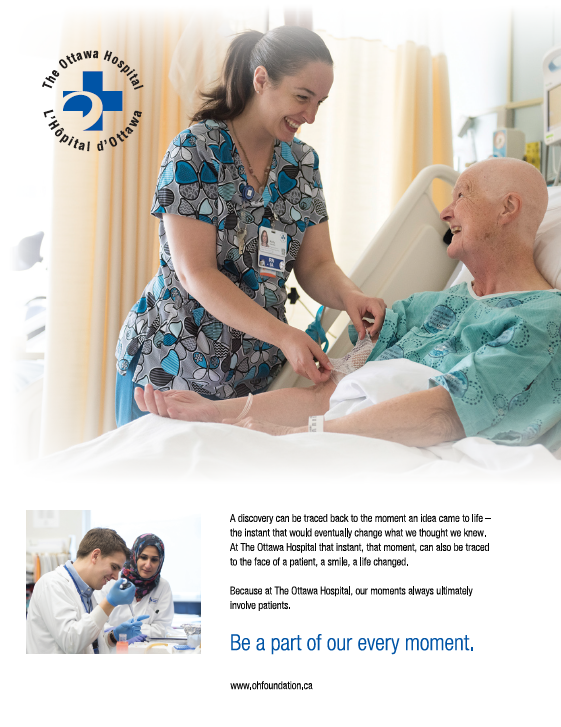 The Ottawa Hospital’s Run for a Reason participation in Ottawa Race Weekend enables our community to raise funds to support The Ottawa Hospital across a variety of funding priorities that personally connect with them. Our supporters raised $310,000 in 2017, making us the largest charity supported at the event.